HomeTechnologyThe Man Who Made Your iPhone Wants to Run Taiwan. A Sea Goddess Backs Him, He Says. April 17, 2019 Technology Comments Off on The Man Who Made Your iPhone Wants to Run Taiwan. A Sea Goddess Backs Him, He Says. TAIPEI, Taiwan — The billionaire Terry Gou, whose company is best known for manufacturing iPhones, announced Wednesday he would run for Taiwan’s presidency, saying his bid had received a divine blessing — from a Chinese sea goddess. Mr. Gou’s entrance into the presidential race shakes up Taiwan’s political playing field and draws into sharp focus the self-ruled island democracy’s strained relations with China, where his consumer electronics giant, Foxconn, has large investments. 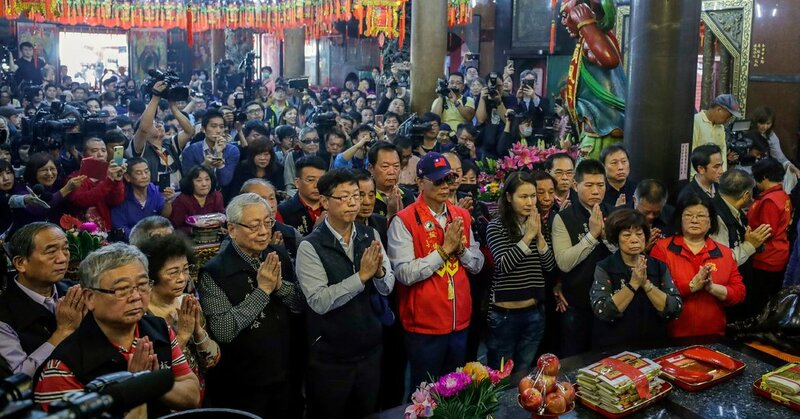 Earlier in the day, Mr. Gou donned a baseball cap and sunglasses and visited a temple in Taipei dedicated to a popular Taoist and Buddhist goddess, Mazu, who is believed to protect seafarers. Mr. Gou told reporters the deity had approached him in a dream, entreating him to run for president in order to improve the economy and relations with China. Mr. Gou is not struggling. He founded Foxconn, officially known as Honhai Precision Industry Company, in 1974, and led its growth into one of the world’s largest corporations, with more than one million employees. Unlike his rivals, he has no experience in government, but his personal wealth, estimated by Forbes to exceed $7 billion, will be an asset, both in terms of prestige and financing his campaign. Taiwan’s slow growth and difficult job market for young people and the working class are expected to be major issues in the race. But also figuring largely are ties between China and Taiwan, which have been strained since Taiwan’s president, Tsai Ing-wen, of the independence-leaning Democratic Progressive Party, took office in 2016. Mr. Gou would seek the nomination of the opposition party, the China-friendly Kuomintang. Mr. Gou has long toyed with the idea of a presidential run, but Taiwanese news reports say he became serious about running in the upcoming election after a fellow businessman, Donald Trump, won the American presidential election in 2016. In 2017, Mr. Gou was feted by Mr. Trump at the White House after his company, Foxconn, announced a multi-billion-dollar investment in Wisconsin. Mr. Trump praised his business acumen, calling him “one of the great businessmen of our time,” and their personal relationship is likely to benefit Mr. Gou’s campaign. Although wages have grown in the past three years under Ms. Tsai’s administration, the economy is expected to be a major factor in this year’s primaries and January’s general election. Austin Wang, an assistant professor of political science at the University of Nevada, Las Vegas, who studies Taiwan, said that Mr. Gou’s business background will set him apart from candidates in both the parties. In addition to making multiple visits to the Trump White House, Mr. Gou also has direct access to the top leadership in China, Taiwan’s largest trading partner. Just days after Mr. Trump lavished praise on him in Washington, Mr. Gou showed China’s premier, Li Keqiang, around a Foxconn manufacturing facility in the central Chinese city of Zhengzhou. Given that neither the United States nor China have official relations with Taiwan, access to top leaders in Washington and Beijing is something that none of the other candidates in the Kuomintang primary can boast about. Mr. Gou joins a primary field that includes Wang Jin-pyng, the former president of Taiwan’s legislature, and Eric Chu, who lost to Ms. Tsai in the 2016 election. Observers say Han Kuo-yu, the populist mayor of the southern port city of Kaohsiung who has been at the center of Taiwan’s political discussion for the past half a year, may also run. Other potential Kuomintang candidates include the party’s chairman. The party’s primary is in June. Regardless who emerges as the Kuomintang candidate, the race promises to focus heavily on Taiwan’s tricky relationship with China. China considers Taiwan to be part of its territory and has stepped up pressure on President Tsai’s administration by increasing its military activities near Taiwanese waters and airspace and poaching its diplomatic allies. President Tsai is facing a primary challenge within her party from her former premier, William Lai, who is an outspoken supporter of independence for Taiwan, in contrast to Ms. Tsai’s pragmatic approach. Mr. Guo’s speech at the temple Wednesday was delivered in the Taiwanese language, a nod to Taiwan’s unique identity. Yet his choice to cite Mazu, a deity hailing from across the Taiwan Strait in the Chinese province of Fujian, also carried significance.